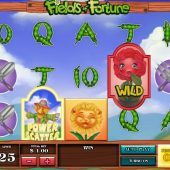 Fields of Fortune slot could be about warfare or metal detection but here we have a theme of peas in pods, flowers and gardening tools. Does it get more exciting than that? Well 25 lines over the standard 5 x 3 reel format is where this seed is planted and symbols are all single ranging from flowers to implements down to card values of which the letters and numbers are composed of pea pods - unless in the free games where they can be composed of carrots or parsnips. Interesting. So you do get a decent 40x stake for the top sunflower win of 5-of-a-kind down to 2x stake for the 10's. You even get expanding Red Rose Wilds on the centre 3 reels so more than one pay line of any 4 or 5-of-a-kind is possible. The reels spin quietly with a tinkling noise for any wins unless a Wild lands in which case you hear a disturbing child-like giggle that would be better placed in iSoftBet's Paranormal Activity horror-themed slot if I'm honest. You have the option of paying double your stake for the game to effectively become a 5 x 5 reel slot where the scatters are concerned. 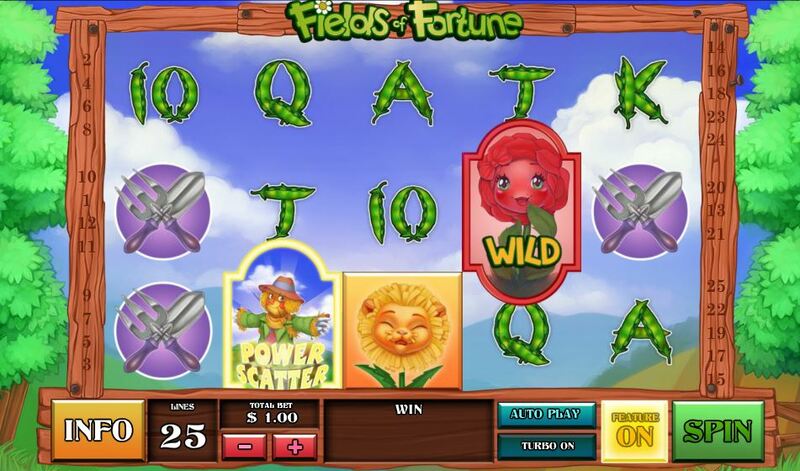 Press the 'Feature Button' to do this, and your standard signpost scatter becomes a 'Power Scatter' which means that you can trigger the free games bonus by any combination of scatters both in view on the reels plus either 1 position below or above the reels. It does give more features though. Carrot Bonus - This means that any scatter landing increases your win multiplier to 2x, 3x and then 5x as each scatter lands. A fourth scatter then calls time on the bonus. So ideally you want to get to 5x multiplier and avoid seeing that fourth scatter as long as possible. Parsnip Bonus - This results in the 3 highest paying symbols evolving into Wilds in turn as each scatter appears. So like the Carrot Bonus, you want the first 3 to appear as quickly as possible then get as many spins as possible before the fourth terminates proceedings! In both choices above the expanding Wilds of the base game change into stacked Wilds which seems rather odd.